Stander Marine in Leland MI was built in the 1950s. 10" wood logs were driven into the river bed to support finger docks for the marina. The finger docks also supported the roof. Over time the logs started to decay at the water line compromising the finger docks and the roof. 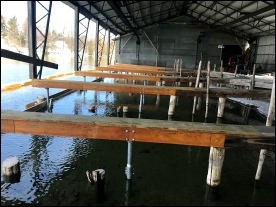 DFR Services was contracted to install (90) Helical piles to support the finger docks and the roof. (62) piles were installed vertical from 14'-21' deep to 20 kips. (28) battered piles installed 7'-14' deep to 10 kips. 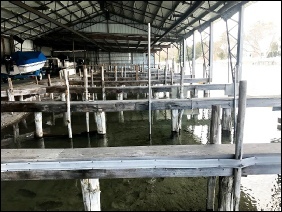 All roof support piles had a battered pile installed next to it for lateral support due to boat impact on the finger dock. Work began in February and was completed in April. The first building was completed in February working on the ice. DFR cut holes through the ice 18' thick to install the helical piles. 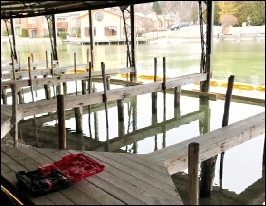 The second building work was done by building work planks over the water. 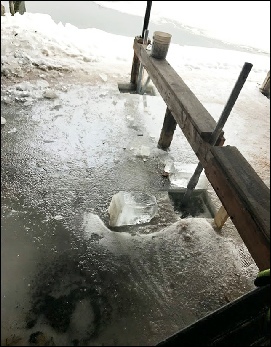 This area did not freeze due to current in the river. Each finger dock had (2) vertical piles and a battered pile. DFR would use temporary supports to pick up the roof load remove the existing dock cut the old logs off. Install helical piles and rebuild the finger dock and set the roof. support back on the finger dock This was all done one slip at a time to maintain roof support. New side board and top boards where replaced on the finger docks above the rotted log timbers. 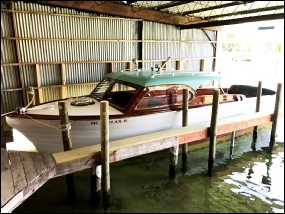 All log timbers along the shore were able to be saved for a cost savings to the Marina. DFR Services completed the project April 14 2018 two weeks ahead of scheduled the slips were ready for the boats on May 1st. Work was done on the ice in the winter months. 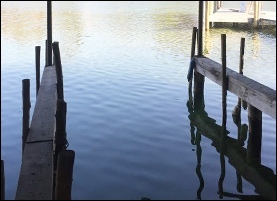 Battered piles where installed and attached to vertical piers with a u bolt connection below the water. Custom bracket's where designed and through bolted through 1 3/4"x 71/4" lvl carriers with 3/4" carriage bolts. Helical piles where a very good solution due to ease of install with limited head room and with the ability of being installed close to existing logs. With limited disturbance to the river with no spoils or soil displacement. All work had to be completed before May 1st while the river was low and before the boats were in the slips. Length of pile shaft unsupported in verifying depth of water from 4'-8'. Existing logs under roof supports limited pier locations for direct load bearing. With the roof in the way of any driven pile options and existing logs being in pile locations this limited many other pile options.